Welcome to the Museum at the Cavendish Laboratory. The Museum at the Cavendish contains apparatus used in some of the Laboratory's most famous researches. This online version allows these displays to be seen by those who are unable to visit Cambridge. 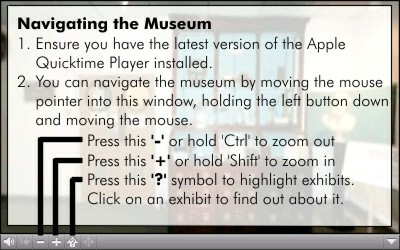 Please view the museum with the 'Quicktime VR's on the left (if you do not have the Quicktime player, click here). Click on a display to find out more about it. You can navigate the museum by clicking in the direction you want to go, or by using the map. The main room of the museum covers research activities carried out in the Cavendish Laboratory prior to the second World War. The other displays touch on some of the activities after 1945. An Outline Guide to the Museum, by I.J. Falconer, is available from the Cavendish. Areas of this online tour use text from the Guide. Click here to enter the first area of the museum. The photographs used in this tour are intended to show exhibits in situ. If you require a higher quality photograph of an exhibit to be taken in our photography studio, please email the Cavendish's photographer (photographs@cambridgephysics.com).